Sai Dharam Tej’s wait is finally over as his film Pilla Nuvvu Leni Jeevitham has hit the screens today. Also starring Regina and Jagapathi Babu in other roles, let’s see whether this film gives Teju a well deserved launch. Seenu(Sai Dharam Tej) is a fun loving youth who falls in love with Shailu(Regina). He keeps proposing her but an irritated Shailu rejects his love every time. Twist in the tale arises when Seenu comes to know that Shailu is in danger posed by a dreaded goon called Maisamma(Jagapathi Babu) and someone more powerful behind him. What does Seenu do now ? How will he save Shailu from all her problems ? For answers to all these questions, you need to watch this film on the big screen. 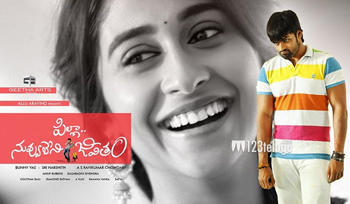 Sai Dharam Tej has done quite well in the film. He is very good with his dances and has worked hard on his performance. For just his second film, he shows decent maturity and carries off a tough role well. He needs to work on his looks and facial expressions a bit more in the future. Regina Caasandra is getting quite gorgeous with every film. She looks beautiful in Indian attire, and has done well in the emotional scenes as well. Once again, Jagapathi Babu plays an awesome supporting role. He performs brilliantly during the first half and has showcased amazing dialogue delivery. Major plus point of the film is the racy narration. The entire credit should go to the director who has narrated the film in quite an interesting way. Pace in the film does not dip much and moves swiftly. Comedy factor is quite good and Raghu Babu walks away with all the credit here. He is hilarious and provides superb entertainment along with Jayaprakash Reddy. Even though the climax is entertaining, it looks a bit overboard with the end result. Love track between Regina and Teju does not look convincing. Regina’s characterization looks jaded and could have been dealt with more clarity. Once the twist in the tale is revealed, the film becomes predictable. Prakash Raj’s character and the political angle should have been showcased more in the first half. Production values look good as the makers have made sure that Teju gets a perfect set up. Anup Rubens’s music is superb, and all the songs fit supremely well in to the plot. Choreography designed for Teju also looks good and the pre-climax fight between Jagapathi Babu and Teju has been designed nicely. Ravi Kumar Chowdary has done a superb job with his direction. The way he has narrated the film with interesting flashback modes is quite novel. Dialogues written for Jagapathi Babu are good and all the scenes between him and Teju have come out well. Screenplay of the film is the biggest highlight, as all the plots and twists have been cleverly revealed. With Pilla Nuvvu Leni Jeevitaham, Tollwood gets yet another promising hero in the form of Sai Dharam Tej. Even though he looks a bit rustic, Teju is quite convincing in his role. Lack of clarity in Regina’s character and chemistry between the lead pair are some basic let downs. But a racy narration, hilarious comedy and beautiful songs cover this up and make this film a decent youthful entertainer.